3 double stateroom cabins, 2 heads, and separate shower layout is truly luxury at its best amongst the cruising world. 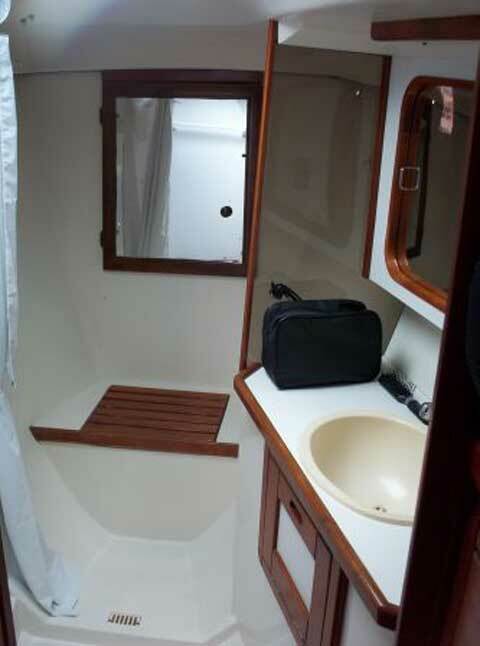 After leaving the large cockpit area and walking down the ergonomically designed companionway, you will have two double bunks, port aft and starboard aft with their own cedar lined closets. 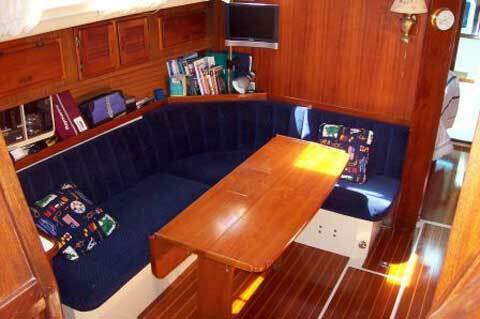 Entering the roomy main salon with its teak and holly sole, you will find to your port an L-shaped dinette and full instrumentation Nav station. 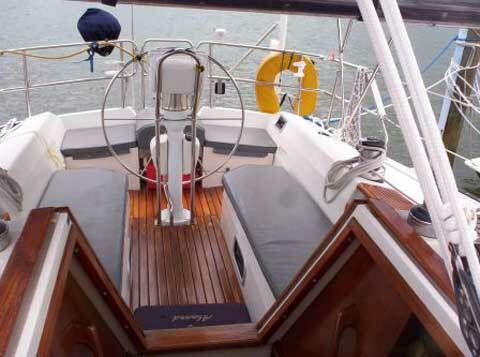 Opposite the Nav station is the aft head, which is perfect for guests. Continuing forward on starboard side, you will find the mariners gourmet galley ready and equipped to feed the hungry crew. Forward of the main Salon to portside you will find a double Pullman berth featuring plenty of drawers, two cedar lined closets, separate head and its own separate shower. 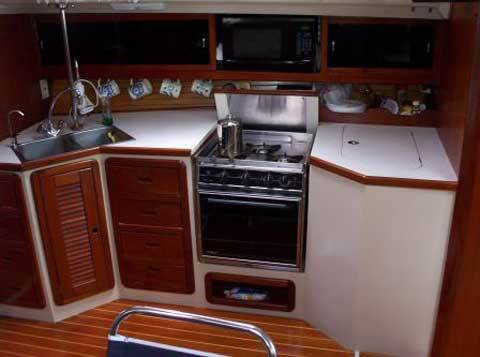 Catalina designed function and fashion to the starboard side galley with plenty of counter space. Abundant storage with all its drawers and compartments make it easy to provision for those long cruises. The large Refrigerator/ freezer and gimbaled 3 burner propane stove with its oven and broiler make it a breeze in preparing a variety of meals. There is even a counter to fold over the stove to give additional counter and working area. Dishes, Flatware, automatic coffee pot, etc. 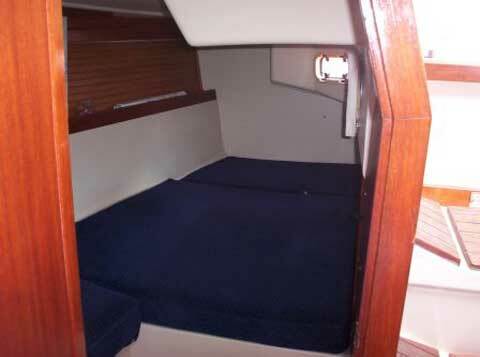 This beautiful Queen size Pullman berth really lets you know you have true luxury in this great yacht. 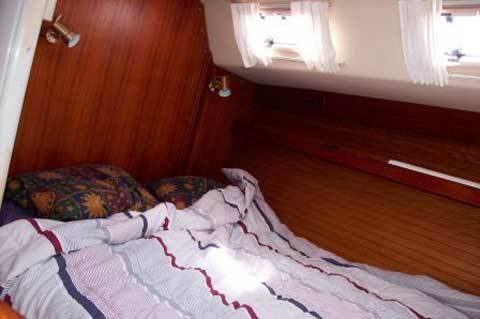 Two large double beds conveniently located aft Port and Starboard with designer fabric and teak interior. Next to the guest cabin is the main head featuring the sink, toilet and its own shower. Four port holes give plenty of ventilation and light. Its cedar lined closets and storage will accommodate the most demanding guest. Bright, light and open describes this main salon. 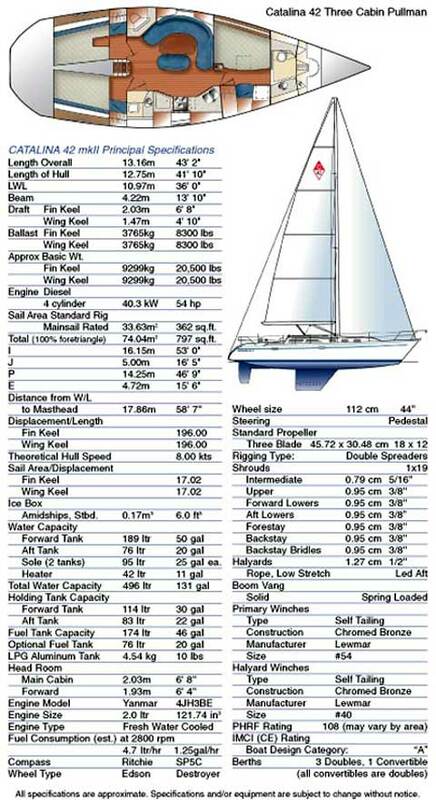 With its large and extra long galley, its hard to find any other boat in its class to compare. A beautiful varnished teak table with two fold down leafs will accommodate 6 or more people comfortably . 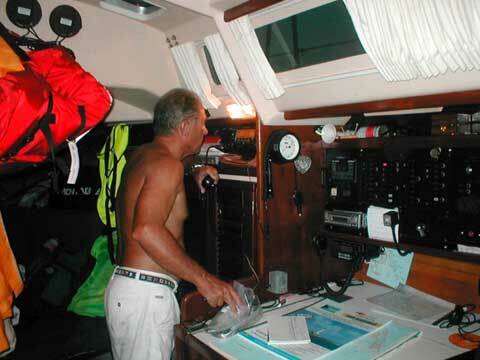 The dedicated Nav station can be accessed from the upholstered seating or can be independent with its own chair . This is a large spacious head with a overhead hatch , stainless sink, two medicine cabinets, separate shower , and a sliding pocket door for complete privacy. 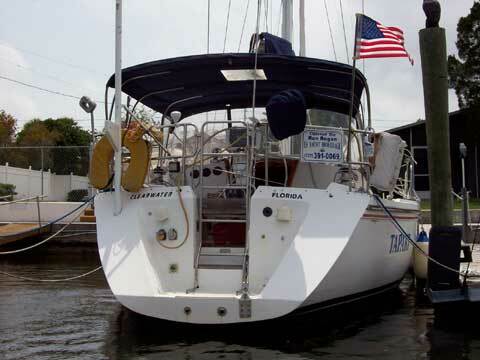 Conveniently located to the companionway/cockpit, galley, guest cabin and main salon which makes the traffic flow work efficient. 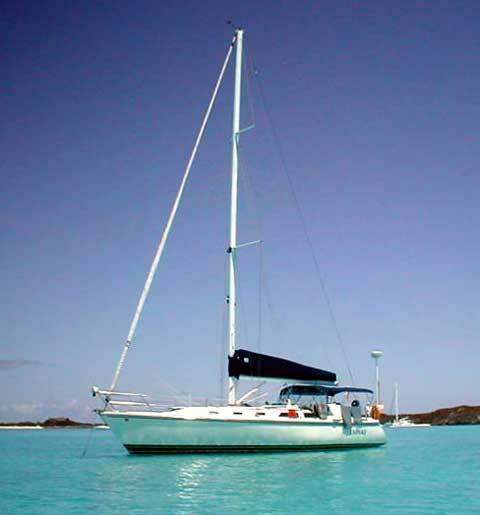 The mainsail is fully batten with a custom Sunbrella Doyle stack pack and lazy jacks. She is rigged for easy sailing with all lines leading to the cockpit. 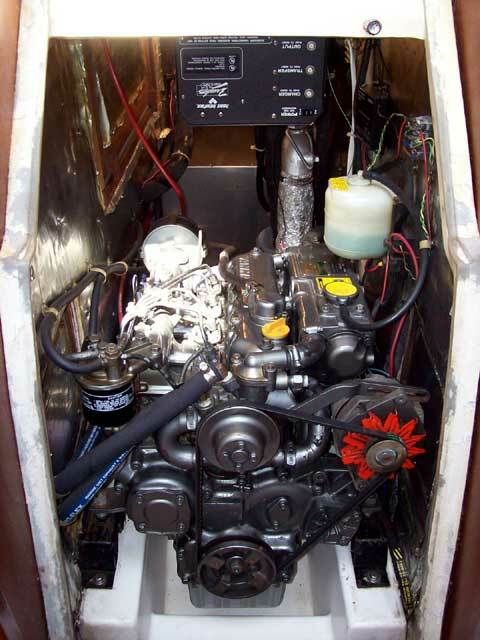 The Yanmar engine is easily accessed through the companionway stairs and three other side hatches. Engine room is well lit and ventilated for comfortable servicing. Spare- Alternator, fresh water pump, nav. Lights, transfer pump, fuel tanks, etc.